Highly recommended websites and databases for all MTSO programs. Cambridge Core Description of this database. Orion Center Bibliography Description of this database. Course Reserves & Permanent Reserves at the circulation desk. 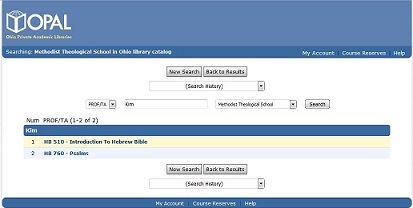 Go To: More Websites & Databases box in this guide for electronic resources. 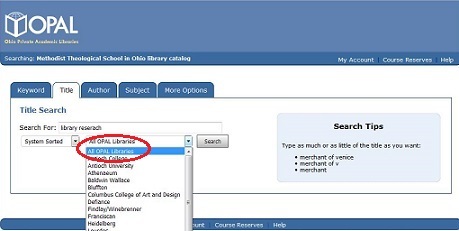 The Ohio Private Academic Libraries (OPAL) serves 25 colleges in Ohio, one of which is MTSO. OPAL's Frequently Asked Questions page can answer many of your questions regarding use of the OPAL catalog. Start your search with the Dickhaut Library collection. 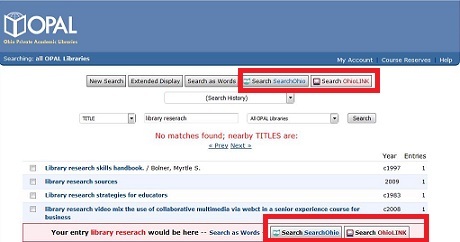 To broaden your search, select All OPAL Libraries from the dropdown menu. 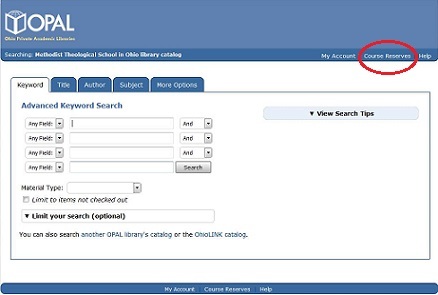 Research further by accessing the OhioLINK (Other Academic Libraries in Ohio) and SearchOhio (Public Libraries in Ohio) catalogs. Select and request materials. The barcode on the back of your student ID is your library card #. Please contact the circulation desk at 740-362-3450 for assistance. Thank You. 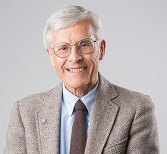 Requests may take at least ten working days to arrive at Dickhaut Library.You will be notified by e-mail when the Library has received the book. 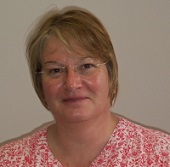 Dickhaut Library tries to find libraries that lend materials free of charge. However, in rare cases, a lending library may charge a fee to loan an item from its collection. You will be notified of any fees in advance before a request is submitted. 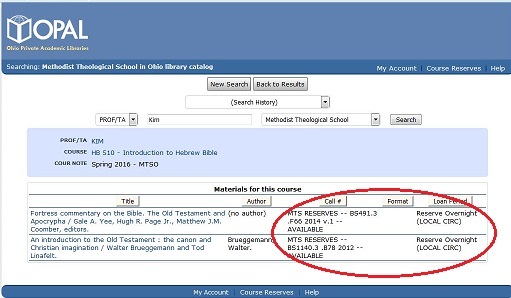 Course Reserves are materials used for a specific Academic Term and are available to anyone with a Dickhaut Library card. Permanent Reserves are specific textbooks repeatedly used for Course Reserves and can be used while at the library. The circulation staff will assist with checking out Course Reserve material. 3 hour loan period - overnight borrowing 1 hour before the library closes. From the due date, a 24 hour grace period begins during which a series of over due email notices are sent to you. As of the end of the grace period and the sending of the third overdue notice, fines are levied at $0.20 per day retroactive to the original due date. As the hour 26 following the original due date, fines accrue at a rate of $0.30 per hour for an indefinite period. Item are also considered lost at this point and reach the BILLED status. Please see: MTSO library patrons: "MY Account" box on this Home Page, under the Fines & Fees tab, BILLED items for more information. 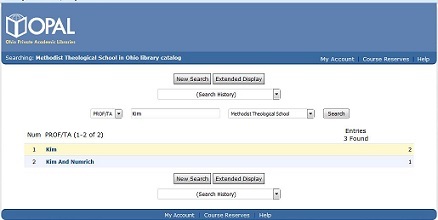 Access Course Reserve in the search window of the MTSO Library Catalog. PLEASE NOTE: All OPAL Libraries will have their instructors and courses listed in the OPAL Catalog. Call number and status of the item is noted to the right of the title. Please contact the circulation desk 740-362-3450. Thank You. * US. Library of Congress. Copyright Office. Circular 21: Reproduction of Copyrighted Works by Educators and Librarians. Revised Aug. 2014. Accessed 11 Sept. 2014 .